Arcus is a perfume by Amouage for men and was released in 2005. The scent is fresh-floral. The production was apparently discontinued. So, at last, one Amouage perfume has become part of my collection. When I was working for Volkswagen, I used to drop in a local perfume shop in Wolfsburg once in a while where I usually spent half an hour with the shop owner who shares the same passion. On one of that occasions, she generously offered me her last flacon of Arcus, with a rebate of 50 €. One does have principles! Personally, I categorically refuse to pay twice of what's appropriate, just because the sultan himself is said to be involved with the foundation of this house back in 1970. Most of their line-up is not traditional Arabian perfumery, what is available in my country is usually in line with Western tradition. Also Arcus was priced with a 150 € tag – and so, the reason why it was discontinued is pretty obvious: too expensive for a summery eau de cologne! Arcus is particularly light, an ethereal fougère with discreet herbaceous hints and a restrained freshness which is derived both from green notes and from very cautious floral parts. Everything about this fragrance is discreet. Even the fig leaf note that is so distinct in most perfumes is diluted almost beyond recognition. So, it is difficult to characterize Arcus. Everything is interwoven with each other, a perfect harmony. This is well done – only you don't really know what this fragrance is up to. Arcus rather stays in the background, with moderate longevity. This makes such a fine eau de cologne a bit complicated. You have something fresh around you, but you cannot relate to it in a certain way. With Arcus, you cannot decide to wear, let's say, a fig fragrance, or something aquatic, or something citric. Arcus simply doesn's allow such a determination. Maybe, to some extent this indifference can be considered typical for Amouage – I think you also find it in the expensive Opus series. This style followed by some Amouage perfumes makes these fragrances a good alternative to sometimes too strong statements of mass market perfumes, and to one or the other oriental crash landing among the niche fragrances. Thumbs up or down? This decision is on a knife-edge. It is justifiable to put Arcus back onto the shelf: because absolutely nothing about Arcus makes it really special. After all, it is just an ordinary, and even weakish eau de cologne - except for the fact that it is refined and overpriced. Well done indeed, but then, Arcus is not the only good perfume around. Let's call it understatement – and after all, some people need a high price tag to appreciate a fragrance. For me, the Arcus air of refinement resulted in a long term relationship. I have to admit it is a joy to wear, but one would hardly experience this joy at first sight. 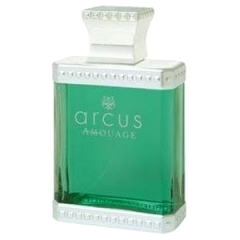 Very few people appear to have reviewed Amouage ARCUS, and I'm not at all sure why, given that it was launched in 2005. I do see that ARCUS has already been discontinued, and so now I'm wondering whether perhaps it was a limited edition, which would explain why so few people ever got their nose on this creation. My own sample was included in a set which I ordered from Parfumsraffy a couple of years ago, but it got lost in the shuffle of my rather chaotic queue. As my mission in 2013 is to review every perfume already in my possession, I was happy to happen upon this sample set today and to discover ARCUS. This is a smooth and very well blended cologne which to be honest seems to me a lot like a violet-leaf creation in the spirit of EAU DE CARTIER. Perhaps fig leaves and violet leaves smell alike, but I must say that I do not notice any true fig quality in this composition whatsoever. I do smell a finely woven tapestry of a variety of different notes, but the overall effect ends up rather homogeneous. The lavender and basil definitely do not leap out at my nose at all, even though I usually find them to be quite salient notes. I believe that this is a unisex creation because of its similarity in style to EAU DE CARTIER. Some people would find this sort of composition more masculine, but I do not get that big cologne guy vibe which marks the line beyond which I generally do not tread. Here, the characteristically masculine notes are judiciously applied to create a fine blend. I like ARCUS a lot. I am not however convinced that it is necessary to pay Amouage prices to find this sort of thing. Still, I have enjoyed this experience and am happy to have found another Amouage friend, though we shall never meet again. Write the first Review for Arcus!